Thursday, September 22 is Bulgarian Independence Day; the day on which Bulgaria separated from the Ottoman Empire in 1908. To celebrate this great day, four friends and I embarked on a four-day trip to Athens, Greece. Leaving Blagoevgrad at 8PM on Wednesday and arriving in Athens at 7AM on Thursday via bus proved to be a nice little adventure. When the bus arrived half an hour late (we’re still not used to Bulgarian time), we began to freak out. After speaking a few words (in Bulgarian) with a couple women at the bus stop, we were reassured that we had not missed the bus. Finally, the bus pulled up to the stop and we piled on; quickly sitting in any available seats. My seat happened to be next to an old Bulgarian man with gas and a snoring problem. Obviously, it was a great trip! After ten hours on the road (and one at the border between Bulgarian and Greece) we arrived in Greece. Our hostel was only a five minute walk from the bus station (maybe ten minutes with all our bags) and the staff was very kind to us. Even though we were not allowed to check in until noon, we were allowed to go up to our room and partake in the free breakfast. After a quick nap and breakfast (including three cups of coffee for me) we left for the day. On the way, we met another student who had just arrived in Greece from Israel; a welcomed member to our group. Because all public transportation was on strike, our feet propelled us throughout our first day. The Acropolis was a forty-five minute walk from our hostel; allowed us to see a lot of the city from the ground. On our way, we stopped at a Greek meat market where venders were selling all types of animal products; the sounds of bargaining and the smell of meat mingled in the air. Greeks men yelled and waved large knives in our direction; causing us to quickly exit the area. Before climbing to the top of the Acropolis, we explored Ancient Agora; the heart of the ancient city. 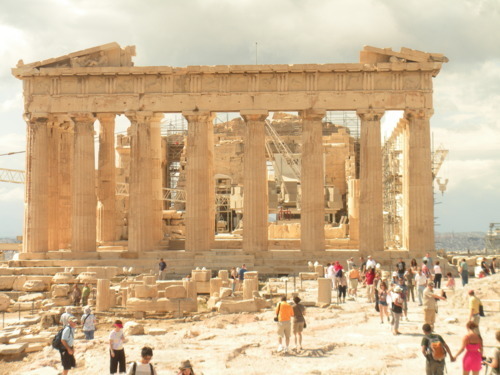 Reflecting on the history of the Acropolis and the message delivered by Paul draws me closer to my Lord and Savior; allowing me to revel in the fact that I praise the God who is too large even for the great Parthenon! 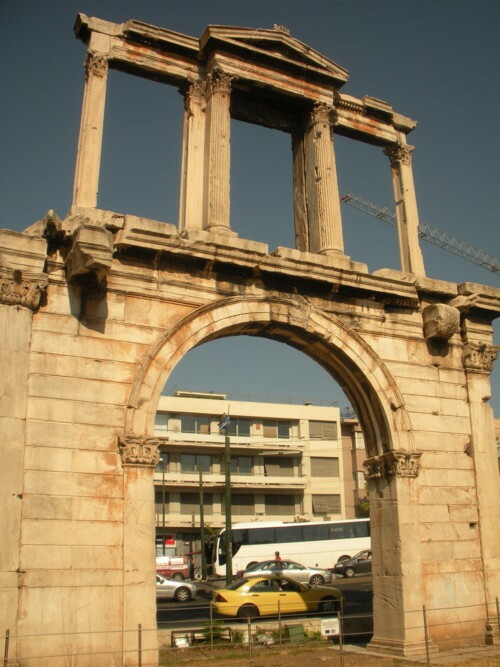 On Friday, we purchased tickets for a bus tour of Athens; seeing sights that we were unable to reach on foot the previous day. Although I was not gung-ho about riding on a bus with other tourists while listening to a tour guide through my ear buds, my Austrian friend (Julia) was really excited to ride on top of the open-air bus. We saw the Temple of Zeus, the Greek Parliament (where demonstrations were most likely to occur), the National Gardens, the Tomb of the Unknown Soldier, the Panatheniac Stadium, and the new Acropolis Museum. Saturday was more relaxing because we were tired from all the sightseeing on Friday. To enjoy a different perspective of Athens, we rode the metro the Piraeus (the port city along the east coast of the Saronic Gulf). After exploring the area, we sat down at a café to eat baklava (a rich, sweet pastry associated with the former Ottoman Empire) and sip frappes. We enjoyed the ocean breeze, the company of friends, and the entertainment provided by card games. Returning to Athens, we ventured outside of the tourist district for dinner at a traditional Greek taverna. Although the locals did not appear until 9PM, we had the entire outdoor garden to ourselves along with the Greek servers. Our last day in Athens began with another trip up to the Acropolis; allowing us to enjoy the bird’s eye view of the city one last time. We visited the National Archaeological Museum; filled with important artifacts from various archeological locations around Greece. During World War II, the antiquities were sealed in protective boxes and buried to avoid their destruction and looting. The large collection of sculptures fascinated me as I wondered among their lifeless figures. Our last dinner was at another taverna, where I enjoyed my sixth authentic gyro of the trip. We grabbed our bags from the hostel (plus a few additional souvenirs) and made the journey back to the bus station. We were all very sad to say goodbye to Athens (though not the euro or the prices) and board the night bus back to Bulgaria. Returning to Blagoevgrad at 5AM this morning (Monday) and climbing into my bed for a few hours of much needed rest before class felt like coming home. After only one month in Bulgaria, I know I will miss my new home when I return to America!